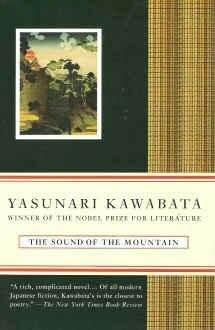 A few days ago, I posted on Twitter lamenting about how I’d never managed to get into anything by Kawabata other than Beauty and Sadness (an amazing book that you should all read). And a day later, I picked up his book The Sound of the Mountain and found myself really responding to it. The book is about 62 year old old man with a failing memory whose household includes his wife, his son, his daughter-in-law, his daughter, and his two grand-daughters. The plot has that aimless quality that I’ve noticed in many Japanese novels. Much of it is about contemplating the mountain and the gardens. He attends the funerals of a few of his friends and meditates on their absence. He slowly befriends his daughter-in-law. He thinks about the distance that’s grown up between him and his wife. A lot of Japanese novels include some attempt, by the characters, to enjoy traditional Japanese art forms. In this case, the narrator buys several No masks (i.e. the masks that actors would wear in a No drama) and spends some time contemplating them. This is pretty interesting to me, because there’s nothing similar in English literature. You don’t often see characters in our novels seriously think about the ballet or the opera or classical music or even poetry. We Americans are extremely disconnected from our traditional art forms, but we don’t seem to miss the absence. I don’t know enough about Japanese culture to be able to speculate accurately about the reason for this difference. Whenever I read a Japanese novel, I’m struck by the weight of history. All of these places have been inhabited, more or less continuously, and more or less peacefully (i.e. without major interruption by invasion or collapse of civilization) for thousands of years. To live in a town in Japan means being connected to the people who’ve come before you in a way that I don’t think anyone in the West can really understand. Every Western civilization has suffered major upheavals–changes in government and in ethnic makeup–that far exceed anything Japan has seen. But, at the same time, Japan (at least the Japan in these novels) doesn’t feel exhausted or tired or decadent. In the west, we’ve been programmed, because of the fall of successive waves of empire (the Roman, the Holy Roman, the British, etc) to think of civilization as either expanding or being in decline. Whereas Japan’s situation seems so different. Kawabata’s novels are about a Japan that’s suffered a major setback…but is still expanding. A Japan that’s economically vibrant without being politically powerful. And even though the business and economic and political backdrop is submerged in these novels, you can see the tension there in the way that these characters try to reconcile their current way of life with their traditional cultural forms.